Nature Playcare provides young children with an opportunity to immerse themselves in play-based learning in a natural environment. The spring camp features four facilitated 1/2 day experiences in either the morning or afternoon over the spring break. Nature Playcare promotes respect for our natural environment and a sense of well-being in nature. Parents can expect an age-appropriate nature experience, which is designed to foster the development of each child's resiliency, confidence, creativity, imagination, and independence. What does Nature Playcare look like? 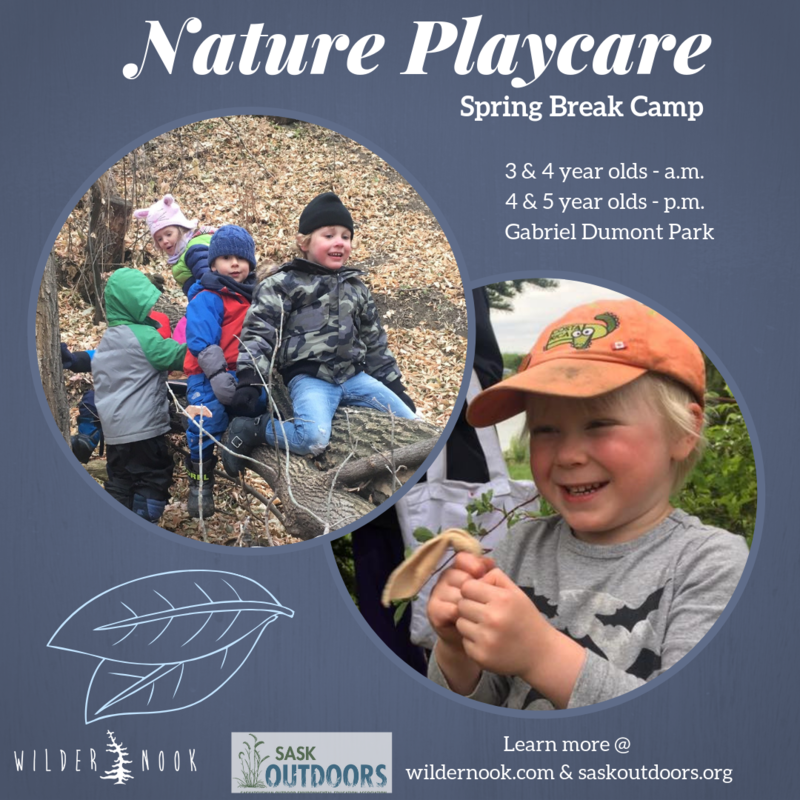 Each session will begin with a short gathering followed by unstructured play and exploration in the beautifully wild Gabriel Dumont Park. This includes children taking carefully managed and supported risks appropriate for their capabilities and the site (for example, sliding down a hill and climbing or balancing along a log). Wildernook facilitators Jana Miller and Zoe Arnold will use holistic, child-centred practices to support each child’s development. Requirements: This is a fully outdoor program that will proceed in all types of weather. To ensure your child has the best possible experience, warm outdoor clothing that can get dirty including rain pants, jacket, rubber boots are required. Suggestions for types of clothing and layering will be provided on registration. Is Nature Playcare the right fit for my/our child? The age groupings for Nature Playcare are 3-4 years old (a.m.) and 4-5 years old (p.m.); we also suggest that each child is able to communicate a need to go to the bathroom. Please contact if you have any questions about clothing or other requirements. Cost: $100/child, or $90.00/child for SaskOutdoors Members. Accessibility Cost: $25/child. SaskOutdoors will subsidize the cost of participants who identify as Indigenous, newcomers to Canada, or living in low income families. The goal of these subsidized spots is to increase the accessibility of the program. Please note, SaskOutdoors would like families making use of this support to follow up with a letter sharing about their child’s NaturePlaycare experience. Please contact if you would like to register your child for one of these subsidized spots.